The Lifetime Sport Fisher is the ultimate fishing kayak. The tunnel hull design makes it possible to stand up and fish, or to sit side-saddle without tipping over. It seats up to three people, providing comfortable, balanced seating for solo, tandem, or family fun. With scupper holes, multiple footrest positions, and moulded carry handles, the Sport Fisher is perfect for recreational fishing trips. The Lifetime Sport Fisher also includes two padded backrests, fishing pole holders, and a 6" storage hatch for added convenience. An optional accessory mount even makes it possible to add a rudder or electric motor to your kayak. The StormPro Center Console Boat Cover by Classic Accessories provides a heavy-duty cover designed for both long-term storage and highway travel. Won't shrink or stretch, designed for extra durability, fabric coating technology for max water repellency, UV protection, mildew resistance and all-weather protection. 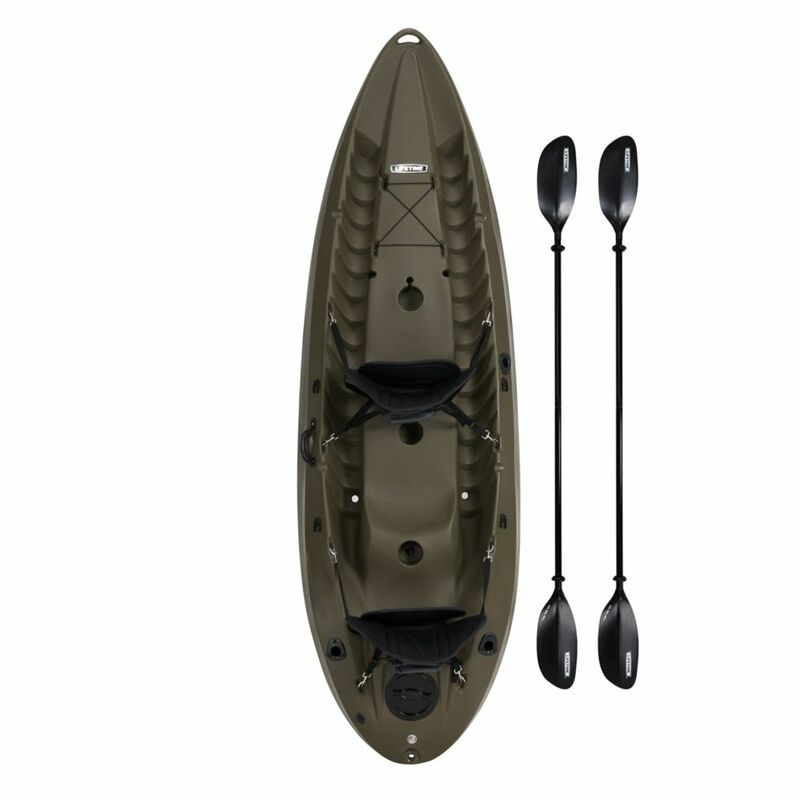 Lifetime Sport Fisher 120-inch SOT Kayak Olive Drab Green The Lifetime Sport Fisher is the ultimate fishing kayak. The tunnel hull design makes it possible to stand up and fish, or to sit side-saddle without tipping over. It seats up to three people, providing comfortable, balanced seating for solo, tandem, or family fun. With scupper holes, multiple footrest positions, and moulded carry handles, the Sport Fisher is perfect for recreational fishing trips. The Lifetime Sport Fisher also includes two padded backrests, fishing pole holders, and a 6" storage hatch for added convenience. An optional accessory mount even makes it possible to add a rudder or electric motor to your kayak. Lifetime Sport Fisher 120-inch SOT Kayak Olive Drab Green is rated 4.3 out of 5 by 110. Rated 2 out of 5 by novicekayaker from pros: stable ob the water, tandem, 3 rod holders, 1... pros: stable ob the water, tandem, 3 rod holders, 1 storage access, cup holder at each station ( front & back for tandem and middle for single) includes back rests and 2 2-piece paddles, price reasonable, dry seat as it sits high in the water, has a $175 transom motor mount/battery case available, seems well constructedcons: Width (36") makes hands and paddles touch sides reducing stroke power & scaring fish (could possibly be solved with longer paddles and higher seat), Sits high in water and subject to wind in paddling and tracking, poor storage (for tackle, fish, life vests, or fish), Has indentations instead of adjustable foot rests, no way to steer transom mounted motor (control would be in center of your backIt has generally a 4/5 ratings as a tandem fishing kayak, guess that figures a lot in the price,,I'm basically satisfied but adding a side mount motor & storage basket with 4 rod holders in back; I question the engineers motor mount without a reasonably priced motor /steering system to work with this < $600 kayak. Rated 5 out of 5 by BikingPilot from The boat seams to be made thicker plastics than other... The boat seams to be made thicker plastics than other kayaks. I think it will be very durable. I have been sitting it in the family room as I add the accessories to find the right places to add pole holders and anchor ties. It seams very comfortable. Rated 5 out of 5 by Shoppermac from Excellent customer service great quality Got a sport fisher kayak a couple of months ago lost the hatch lid. They sent a replacement in a few days very helpful, we recommend their products! Rated 1 out of 5 by Sarah from Arrived with a big hole in the bottom. Returned and... Arrived with a big hole in the bottom. Returned and never re-ordered. Big hassle and disappointment. Rated 5 out of 5 by Happy Wife Happy Life from King Fisher Sit On Top Kayak Researched kayaks, saw it, ordered it. Delivery was lightening fast (within a couple of days). Item was received in great condition. Abit on the heavy side (70 lbs) but the trade offs of sturdy, solid, almost non-tippable make up for it! Bought this for my hubby who doesn’t swim. He loves it! Looking forward to many FUN adventures with it and something we can do together. Love it and recommend it!